At the team’s post weekend debrief, local Brackley residents will be advised to shut windows and doors during an expected several hour long Toto Wollf explosive tirade, whilst Niki Lauda will be bringing is extra sweary phrase book, rumoured to be the director’s cut of the Viz Roger’s Profanisaurus. Nico Rosberg will be advised that the turning in point for Turn 2 in Austria is not in France, whilst Lewis Hamilton will be told to pay for trashing his hotel room in Baku (allegedly). Though he may be let off with a warning, as it transpires that the hotel staff had put Nicole Sherzinger CD on repeat in his room, as they only had four year old Hello magazines for research. 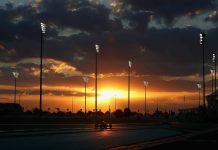 F1 rule makers now need to revise the rules again, based on Bernie’s say so, to counteract rules made as a result of a knee jerk reaction, and Bernie’s original say so. 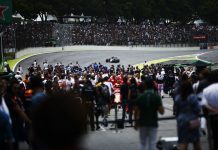 Sergio Perez’s brakes failed on the last lap as the team weren’t allowed to inform him they were about to give up, as the only information allowed to pass to the driver is on safety grounds. Oh no wait there, we’re confused…? Jenson Button is preparing at the McLaren Technology Centre, even more upgrades to his pleasantly surprised face, in the high tech McLaren press simulator. Previously used for trying to clear (unsuccessfully) croaky throats, Jenson’s aiming to bring a new “laughing his socks off” package to the circuit, should he end up near the podium for the second consecutive race. Honda are ready with a new self destruct device should the Britain be in any danger of winning the race, as engineers can’t guarantee they’ll be able to repair his face should he do so. After years in F1, Kimi has finally mastered how to manage the press, demonstrated remarkably on the podium following the Austrian GP. Instead of answering too many awkward questions, the media savvy Finn has perfected answering as few questions as possible by taking up all the available air time. For instance; when we asked how he felt about his podium result he replied, “Well for sure I mean you know it is an ok result, but it’s not that great I mean we could have won, and that’s what we wanted, so we have to work hard and keep going it is like this, and the team know this, and we could have done better I mean it is not great but ok we are here, we are on the podium and it is ok I guess but it is not where we want to be as Ferrari and we know this, but we need to keep improving an.. The HRT F1 Car …And the 2010 grid is complete!